Organic. A sweet and savoury mix. Made from scratch using natural, organic ingredients both locally and imported. Has tons of health benefits including. A versatile nut, the cashew, has potential to be anything you want it to be. Sweet, savoury, mixed or solo, its a flexible friend, down for whatever. The most versatile of all the nuts, packed with nutrients and a smooth creamy texture that works in sweet or savoury dishes. Our Cashew Nut Butter is pure decadent heaven. 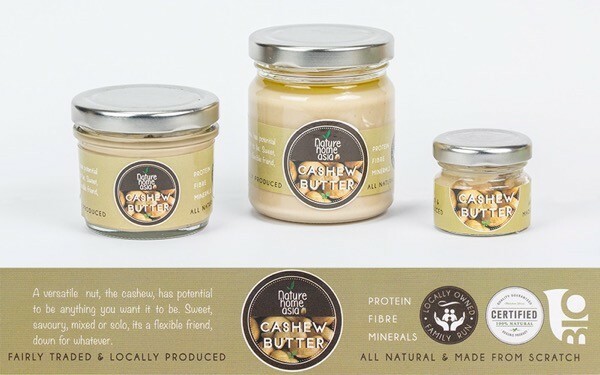 If you are looking for something creamy, delicious, and out of this world heavenly then get your hands on some of our Cashew Nut Butter. You won’t be disappointed! Creamy, buttery and packed with nutrition this stuff is the Cashew Nut Bomb! Cashew nuts are delicately sweet and soft and packed with energy, antioxidants, minerals and vitamins that are essential for robust health. They are one of the popular ingredients in sweet as well savory dishes worldwide and used in so many healthy and raw food recipes. Cashews are rich essential minerals especially manganese, potassium, copper, iron, magnesium, zinc, and selenium are concentrated in these nuts. A handful of cashew nuts a day in your diet would provide enough of these minerals and may help prevent deficiency diseases. Cashew nuts are rich in selenium which is one of the most powerful antioxidants in the body, copper which is a cofactor for many vital enzymes, and Zinc which is necessary for many enzymes that regulate growth and development, and good digestion. Compared to many other nuts, Cashew nuts are very soft and creamy which is why they work so well in sweet and savory dishes. The nut butter can be used as a cream for deserts or cakes, mixed into sauces, used in raw food recipes like energy balls and ice cream and spread as a rich creamy sauce over cakes. If you’re making cupcakes you can use it instead of buttercream. Who needs that dairy and sugar? Just add a little honey or agave and sprinkle with superfoods and berries. Your kids will love it and you will too! All figures are approximate and can vary. Please consult your doctor before taking any products.